We went to Momofuku Milk Bar in New York a few years ago to try their famous desserts. We spent and ate way too much, but the only dessert that we vividly remember is the crack pie. A rich, gooey, custard pie with hints of butterscotch and caramel on top of a cookie crust, it was unlike anything we have had before or since. We couldn't deconstruct the ingredients (though we really tried), so we were excited when the recipe started circulating last fall thanks to Martha Stewart and our friend Mae of Peas Love Carrots. With almost a pound of butter and eight egg yolks, this is a seriously rich dessert, and we would have never guessed it included milk powder and oats. The recipe we used, from the L.A. Times, makes two pies. Since we prepared these with our boys and wanted to keep it simple, we instead made bars using one big baking dish. If you prefer pies, you can follow our recipe and just divide the crust and filling into two pie pans. The original recipe gives measurements by volume and by weight, but the volume measurements are a bit odd (2/3 cup plus 2 Tbs flour, scan 1 cup oats, etc. ), so we chose to use our digital food scale in order to be precise. In doesn't hurt that our kids love weighing everything, making the baking process especially fun for them. The bars have been a huge hit with all of us. However, if you don't want your family baking time to be converted into a "just say no" conversation, feel free to change the name. 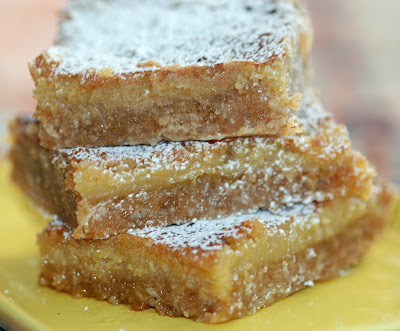 We haven't come up with anything brilliant so in our house they're Crack Pie Bars. Regardless, you are sure to be hooked after you take your first bite. Preheat oven to 325° convection (375° conventional) and place shelf in the middle. Cream butter, brown sugar and sugar with in stand mixer until light and fluffy. With mixer running on LOW to prevent a cloud of flour in your kitchen, slowing add flour mixture until fully incorporated. Fold in oats. Spread in a thin layer on a butter baking sheet and bake until golden brown and slightly crispy around edges, 12 minutes in our oven. Remove to a rack to cool. Crumble cookie when just very slightly warm. In food processor, combine cookie crumbs, brown sugar, salt and butter and blend well until evenly combined and crumbs are fine. Press into a even layer in the bottom of a well-butter pyrex or similar baking dish. Press well to compact and even. Reduce oven temperature to 300° convection (350° conventional). Combine sugar, brown sugar, salt and milk powder in bowl of mixer. Add cooled melted butter and combine well. Add heavy cream and vanilla and combine well. Add egg yolks and combine on very low speed to avoid incorporating too much air. Remove and cool to room temp, then refrigerate. The official recommendation is to serve cold with powdered sugar dusted on top, but we prefer to eat these warm and gooey so we heat the bars for about 20 seconds in the micro. Stored in refrigerator, extra keeps for several days. ** We used a low temperature with our convection oven, so the bars baked quite slowly and evenly. If you use a conventional oven with higher temperatures, you may need to reduce the baking time considerably to avoid over-baking or burning the top, and be sure to rotate your pan regularly for even baking. After seeing this crack pie recipe circulate through the blogosphere I think it is my turn to try this recipe. This looks like a serious dessert! wow I've never heard of these bars, but they look incredible! yum! My family would love these bars for sure, I will try very soon! Wow, they look so good. I might even dip them in melted chocolate, or would that be overkill? Hi there, so nice to see you again! Still trying to catch up with some of them. Hmm...mm... that pie bar looks super yummy. I think I'll use the ready made oatmeal cookies for this instead! Thanks for sharing! Do keep in touch. Bars are such a great idea! That makes it so more dense - it's a natural progression. I have to try this version. This is really a great alternative to real crack - I think I need to introduce this to Baltimore ... could change everything!! This is surely a satisfying dessert. Quite curious about the taste. I still need to find the time to make this. What size baking dish do you recommend for the bars? I baked this in a 9x13 pan and it came out perfect. This is a "Just say No" dessert bar.